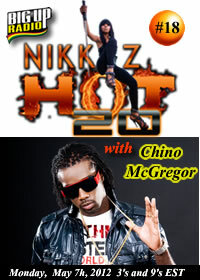 Chino, who was born on the 12th of February 1983, is the son of Jamaican music legend, Freddie McGregor. Surrounded by countless records, endless background harmonies and innumerable instruments, it’s understandable why he developed a strong inclination toward music at a very early age. In fact, so caught up was he that he seized every opportunity to observe and learn from the best in the industry: namely, legends including the late Dennis Brown, Marcia Griffith, Judy Mowatt and Gregory Isaac, in addition to Dancehall icons such as Bounty Killer, Beenie Man and more. These interactions resulted in a comprehensive knowledge of recording and production techniques which would later work in his advantage.